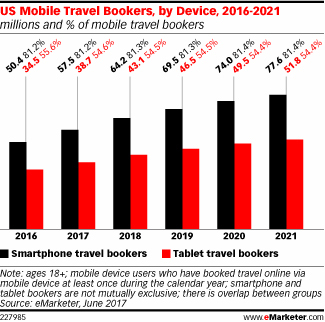 As the summer travel season officially gets under way, a growing number of Americans will use their smartphones and tablets to book a trip, according to eMarketerâ€™s latest forecast on digital and mobile travel. This year, digital travel sales in the US will reach $189.62 billion, 40.0% of which will come from mobile devices. Meanwhile, desktop/laptopâ€™s share of all digital travel sales will shrink to 60.0%. 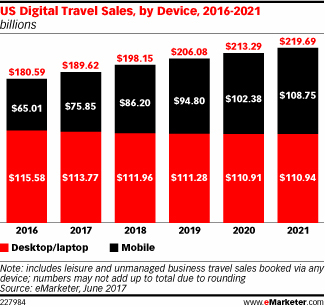 And by 2021, mobile will represent nearly half of all digital travel sales. Copyright 2017 eMarketer Inc. All rights reserved. From http://www.emarketer.com.